Rosa spp 'Yellow Charles Austin' is a modern shrub rose which produces fully double, fragrant, yellow flowers. 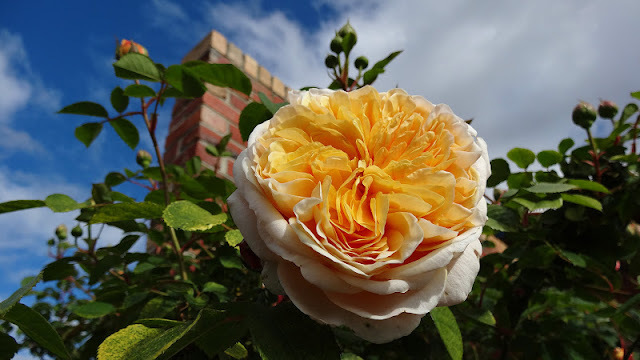 This is bush with splendid, showy flowers that are fully double petalled and belong to the "old-fashioned" rose group. Leaves are medium to dark green, glossy, and ovate, with finely toothed edges. The flowers are quite fragrant. 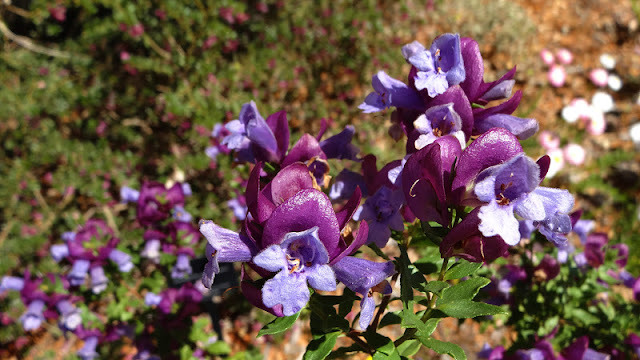 Prostanthera magnifica, commonly known as Magnificent Prostanthera, is a flowering plant in the family Lamiaceae. It is endemic to Western Australia. The species is a shrub growing to between 0.4 and 2.5 metres high. The flowers are mauve to pink and are framed by large, purplish-red calyces. These appear between August and November in the species native range. The species was first formally described by botanist Charles Austin Gardner in 1942 in Journal of the Royal Society of Western Australia. The species occurs in woodland on sand, loam or clay soils. Prostanthera magnifica prefers a sunny or partly shaded position in well drained soil. It is sensitive to both frost and humidity. Propagation is successful from both seed and cuttings, though seed germination is slow. Grafting is often used to produce a longer living plant with rootstocks including Westringia fruticosa and Prostanthera striatiflora .The latter gives rise to plants with a longer flowering period and less unwanted growth below the graft. Anigozanthos pulcherrimus Hook. (Yellow Kangaroo Paw). This species flowers in late spring through to early summer with golden yellow flowers on stems to 1.2 metres and is found naturally on the sand plains between Perth and Geraldton. 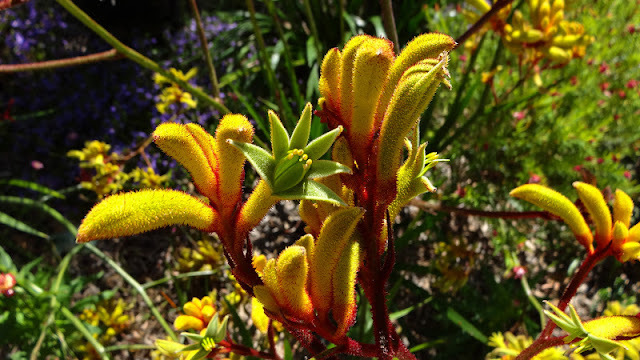 All of the Kangaroo Paw species, especially some newly developed hybrid varieties are very colourful and bird attracting small plant for mixed plantings or in a container for patio and deck display. The genus Lechenaultia is a group of twenty small woody or semi-woody plants endemic to Australia. Their range of colours and shades of blue, green, yellow, red and white make them highly prized for horticultural work. The correct spelling of the generic name, Lechenaultia, is open to some argument. It was named after Leschenault de la Tour, a botanist who visited Australia in 1802-3. However, when Robert Brown, an early botanist first published the name he spelt it Lechenaultia, omitting the 's'. The spelling without the 's' is considered valid by Australian taxonomists. 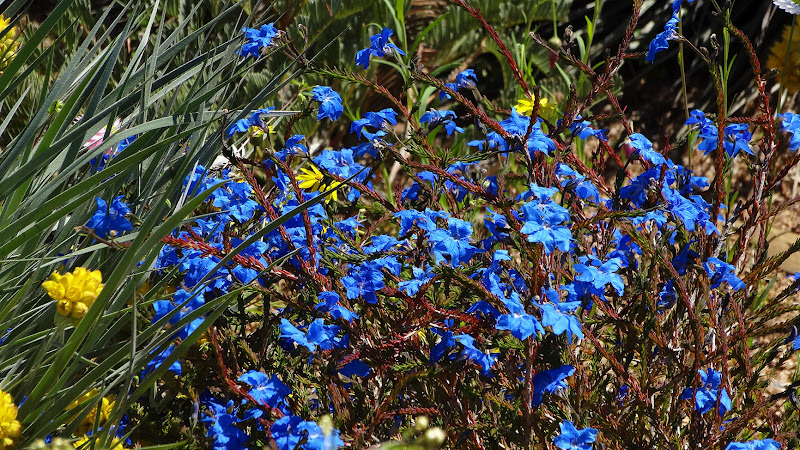 All but three of the species are endemic to Western Australia and the most famous of all is the Blue Lechenaultia - L. biloba.The flowers, which grow to 1.5 cm long by 2-3 cm in diameter, have a tubular corolla, split on one side, and surrounded by five sepals. The corolla has five lobes and when laid flat it resembles an open fan or a hand with spread fingers. In L. biloba the corolla lobes are again divided into two segments, from which the specific name is derived. Flowering time is from late winter through to summer. The leaves are soft, blue-green in colour, 3-9 mm long to 2 mm across, crowded and heathlike.The plant occurs naturally in gravelly and sandy soils of southern and central Western Australia. In its natural habitat it forms an open spreading plant to 50 cm high. 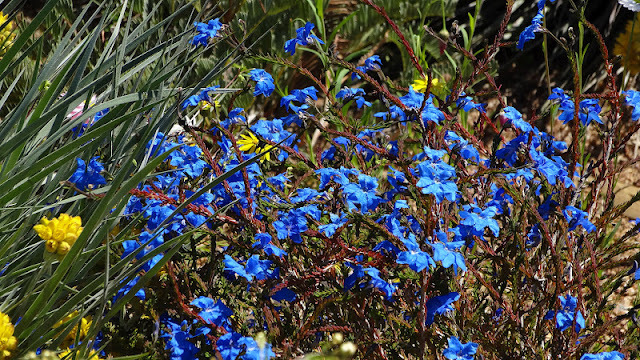 Various shades of blue are the most common flower colour in L. biloba, but variants exist. One is a pure white form while another, a bicoloured form, has been registered as a cultivar. L. biloba 'White Flash' has a distinct white central portion within the flower and a deep blue outer area. In cultivation it is essential that the plant is grown in a sandy, well-drained situation. Plants in heavier sites will generally not last a season. The plant is not a long-lived one, three to four years being its most probable life span. A suckering form of the species exists and this has great potential with a probable longer life.The species is easily propagated by cuttings taken at any time of the year with most success in late spring and summer. The most important cultivation requirement is a perfectly drained situation, best achieved in rockeries, built-up beds or pots. L. biloba has been successfully cultivated in pots for many years in Europe. Minimal watering is required and the roots will penetrate deeply in a free-draining soil. Lechenaultia biloba can be allowed to straggle over rocks, or a more compact shape may be obtained by a light pruning after flowering. No injurious pests or diseases have been noted and the species is frost tolerant.